Only a few days ago, I awarded Creature Comforts’ Tropicalia IPA the highest rating I’ve ever given a beer while writing for Paste. That beer is one of four year-rounders that the 8-month-old brewery is hanging its hat on, the others being an amber rye ale, a pilsner and a classic Berliner weisse. But of those four, the Berliner is the only other currently in cans. And it’s safe to say that the young Athens brewery made another wise decision here with which beer they wanted to package. Athena is a Berliner weisse, a style that has surged in popularity over the last few years as a champion of tart beer’s more approachable end. Rather than making every American wild ale a barrel-aged fruit bomb, Berliner weisse’s show drinkers that sour beers can be low-alcohol, subtle, refreshing and on the drier side. These are important distinctions to make when so many of the sours getting awards and attention are huge, fruit-laden sugar bombs. 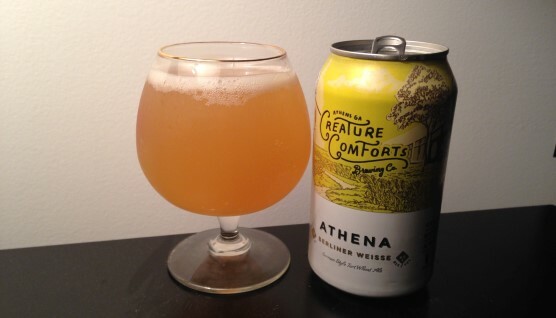 With that said, there’s plenty of flavor in Athena, perhaps moreso than in most Berliner weisse examples that haven’t had fruit or other flavorings added. Its aroma is immediately tangy, implying its tartness, with a whiff of salt water, wheaty graininess and fresh lemon zest. On the palate, it’s mild to moderately sour—perhaps a touch more tart than most commercial examples of the style, actually. The wheat gives it a touch of creaminess and grain flavors, although this is offset by the prickling nature of sour acidity. Lemon again shows up as the prominent citrus note—I suppose you could say it’s a bit like fresh bread and unsweetened lemonade, with a touch of white wine fruitiness as well. This is simply a solid Berliner weisse that will no doubt be especially appreciated in the hotter summer months. It stands fine on its own but could also be doctored with the traditional Berliner weisse sweetening agents, such as flavored syrups, although it almost seems a shame to adulterate a winning recipe that way. I will say this: There is a variation of this beer out there that has been dry-hopped with liberal amounts of Galaxy hops, and that beer is stupendous. If you see the Galaxy dry hopped version, check it out for an interestingly tart, in-your-face hoppy experience.